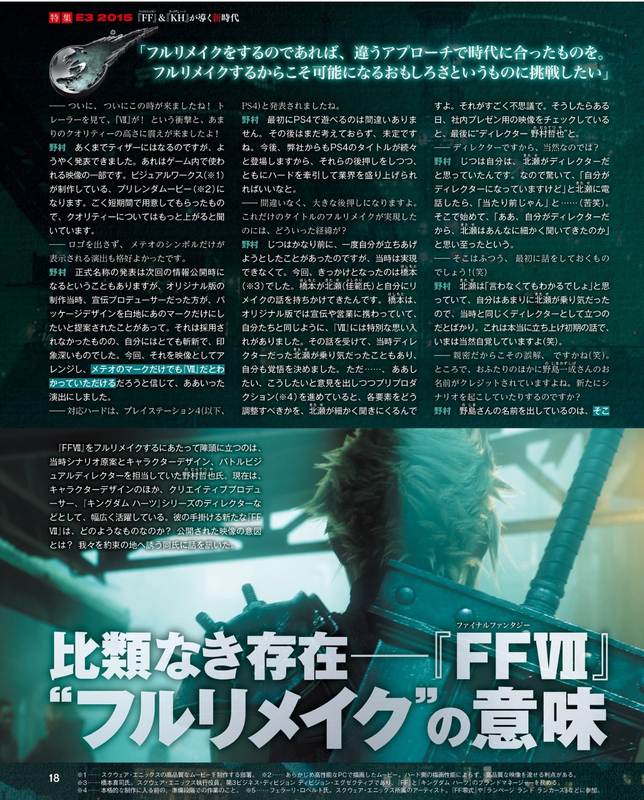 The June 25th edition of the Japanese magazine famitsu contains a spread covering the Final Fantasy VII remake. 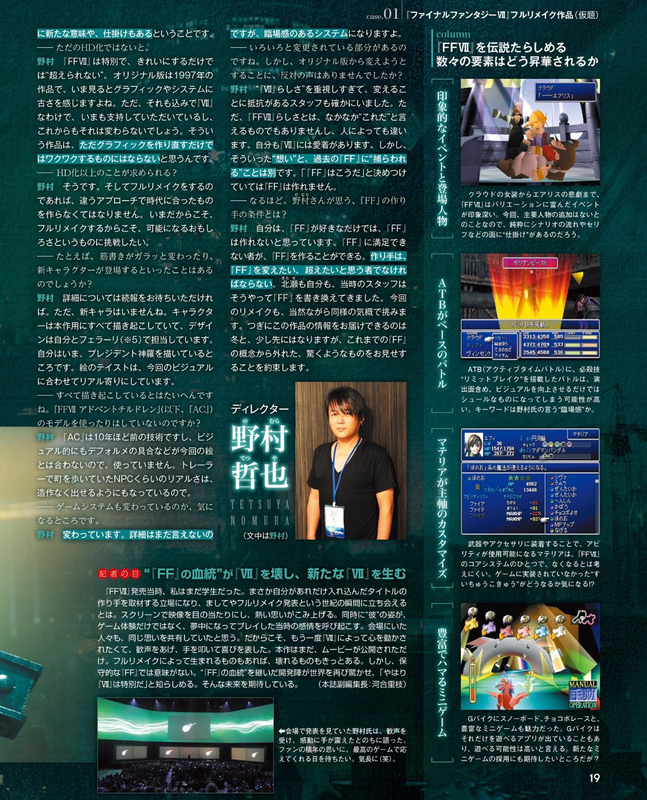 The folks over at Final Fantasy Network have provided scans which contain an interview regarding the remake with Director Tetsuya Nomura. The Lifestream member Hitoshura (currently going by Strangelove on the forums), has provided a translation of the spread. Page one contains the trailer transcript, a blurb about the E3 announcement and the timeline of Final Fantasy VII. 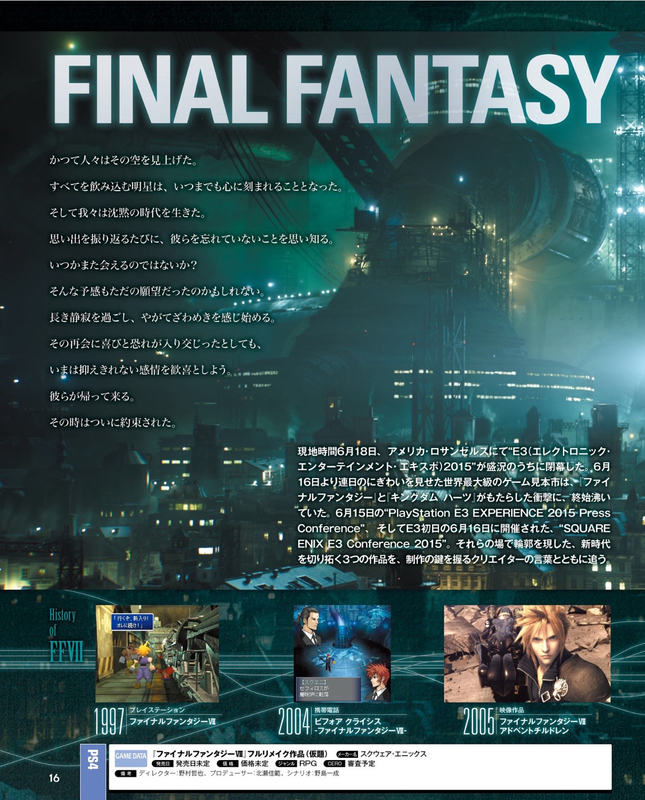 Page two has some text concerning the trailer and the conclusion of the Final Fantasy VII timeline. — It’s finally, finally happening! I got shivers from watching the trailer and the shock of seeing VII and the high quality of it! Nomura: It is merely a teaser, but we were able to announce it at last. That’s part of the video used within the game. It is a pre-rendered movie (*1) made by Visual Works (*2). It was something we had them prepare in a very short space of time, so I hear that the quality will increase more. *1: A movie rendered on a high spec PC. Has the benefit of being able to display a high quality image without relying on the hardware’s rendering capabilities. *2: The department that creates Square Enix’s high quality movies. — Displaying only the Meteor symbol and not the logo looked cool. 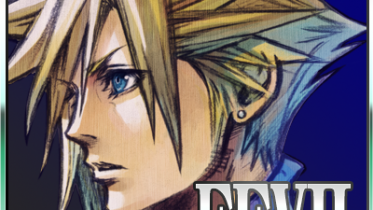 Nomura: The announcement of the official title is going to take place when we next reveal information, so there’s that, but when we were making the original version the marketing producer at the time suggested that for the packaging design we put just that mark on a white background. We didn’t go with that, but I found it to be a very original and impressive image. This time, we’ve arranged it into a video, and went with that under the belief that people would recognise it as VII from just the Meteor mark. – The compatible hardware was announced as the PlayStation 4 (PS4). Nomura: You’ll be able to play it first on the PS4, that’s for certain. After that we still haven’t thought about it, so it’s undecided. Square Enix will be releasing a crop of titles for the PS4 in the future, so we hope that with the support of these titles it will help push the hardware and boost the industry. — No doubt it’s going to be a huge support. 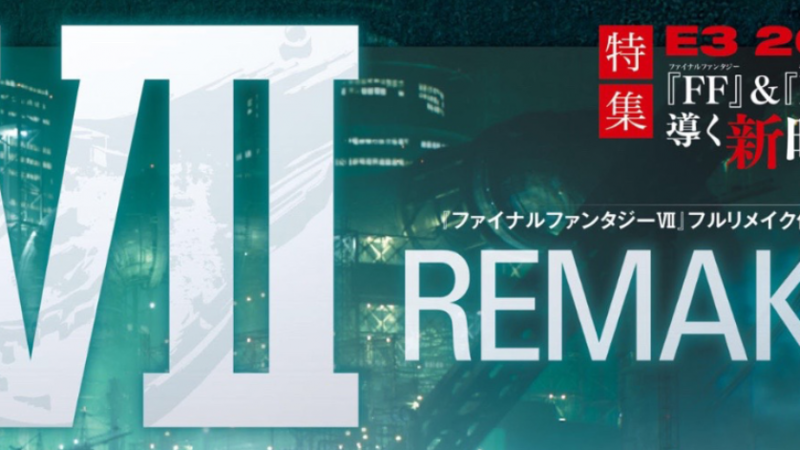 How did a full remake of a title like FFVII come to be? Nomura: Actually quite a while back I had tried to get it off the ground once before, but at the time we couldn’t make it happen. This time it was Hashimoto (*3) who got the ball rolling. Hashimoto came to (Yoshinori) Kitase and myself with the topic of the remake. Hashimoto had been involved with marketing and sales with the original version, and VII has a special place in his heart as it does for us. We heard this and Kitase, who’d been the director back then, was on board for it, and I had made up my mind as well. But… when we were going through the preproduction (*4) giving opinions about how we’d like to do this and that, Kitase comes by to ask in detail how we should coordinate each element. This is really unusual. So then one day, when I was checking a video of the internal presentation, at the end it says “Director: Tetsuya Nomura” on there. *3: Shinji Hashimoto. A company executive at Square Enix. The division executive of the 3rd Business Division, he is tasked with brand management for the FF and Kingdom Hearts series. *4: The preparatory stage of work before moving into the actual production. – You are the director, so it’s only natural? Nomura: Kitase thought I’d know without needing to be told, and since Kitase had been so enthusiastic I just figured that he’s be taking the director position again like with the original game. This is talking about when the project first started, of course I’m well aware of my role now (laughs). – It’s because you’re so close that you get misunderstandings like that (laughs). On that note, Kazushige Nojima’s name was also in the credits. Does this mean he is making a new scenario? Nomura: The reason Nojima’s name is there is because there’s new meanings and tricks involved as well. — It’s not just an HD version. 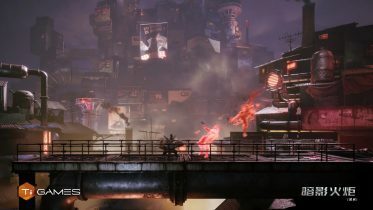 Nomura: FFVII is special, and we cannot ‘surpass it’ just by making it look pretty. The original version is a product of 1997, so to look at it now you can feel its age in the graphics and game systems. But those things also make it VII, and it’s still got support even today, which is probably not going to change. So for something like FFVII, I don’t think merely redoing the graphics is enough to make something you can get excited by. — You’re looking for something more than a HD version? Nomura: Yeah. And if we’re going to do a full remake, we have to use a different approach and make something that fits with the times. We want to try for the excitement you can make possible precisely because we’re making it now, because we’re doing a full remake. — Does that mean that the plot might suddenly change, or there will be new characters appearing? Nomura: You’ll have to wait until next time for the details. However, there aren’t any new characters. The characters are all being done again this game, with the design being done by myself and Ferrari (*5). At the moment I’m in the middle of drawing President Shinra. The art style is more realistic to match with the visuals for this. *5: Roberto Ferrari. An artist with Square Enix. 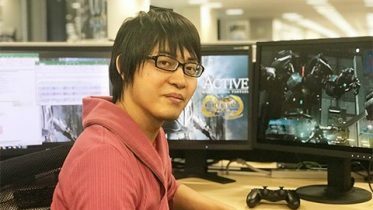 Has worked on titles such as FF Type-0 and Rampage Land Rankers. — Having to design them all again must be a lot of work. Are you not using the models from FFVII Advent Children (AC) or anything? Nomura: AC was made with technology from 10 years ago, and visually with how it was stylised and such it wouldn’t fit in with the images for this game, so we’re not using them. We’re at the level now where we can get the realism seen in the NPCs walking around town in the trailer without trouble, so that’s why. — I’m curious to know if the game system is different as well. Nomura: It has changed. I still can’t give you any details, but the system feels more immersive. — There’s a lot of parts that are being altered. But have there not been any opposing voices to changing things from the original? 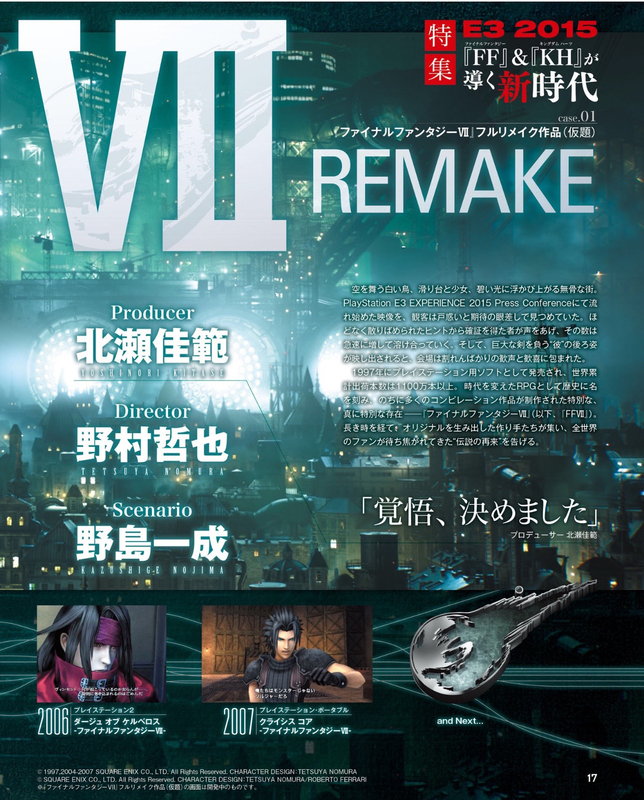 Nomura: There certainly are some staff who put too much of a focus on the ‘VII-ness’ and are resistant to changing it. 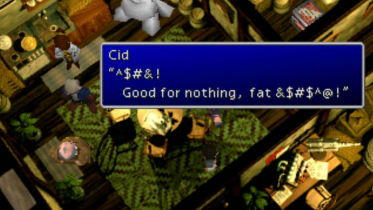 But that FFVII-ness isn’t something you can easily point to and say ‘that’s it!’ about, and it means different things for different people. I’ve got a lot of attachment to VII myself. But those “feelings” and being “trapped” by the FF of the past are two separate things. If you make up your mind, “‘FF is like this,” then you can’t make FF. — I see. What do you think the requirements for a FF creator are, Mr. Nomura? Nomura: I think that love for FF alone isn’t enough to make FF. Someone who isn’t satisfied with FF can make it. A creator has to be someone who wants to change FF, to surpass it. 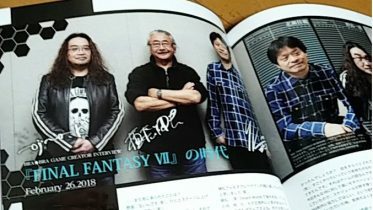 Kitase and myself, all the staff from back then rewrote FF in that way. And with this remake too, we’re naturally going into it with that same mettle. 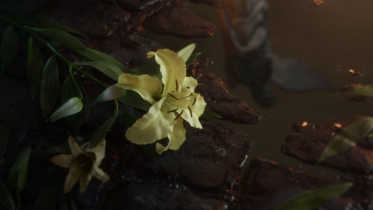 The next time we will be able to bring you info about this game will be in the winter and beyond that, but I promise that we will show you something surprising that breaks away from the concept of FF that we’ve seen so far. Got something to say? Come share it in the thread on our forums. Fantastic work with the translation. That’s made my day! Keep in mind the version of bonsai you might have.Not all of the bonsai trees are produced equal, and perhaps they are seldom as well.Some models of bonsai really are well-suited to be able to being produced indoors; most types develop better beyond your house.Pretty obviously, in house bonsai possess different specifications than accomplish outdoor variations, and vice versa.As an illustration, outdoor bonsai mustn’t be kept indoors for just about any long length of time.A good general guideline is to help keep it inside for several days 30 days at the highest.Otherwise, the transformed temperature and also environment will quickly damage typically the plant. Discover how to water correctly.Since bonsai plants are likely to be small, it follows they’ve a minimal root structure.Bonsai underlying issues systems are likely to be inadequate without any assistance; it will involve human care that will help the herb survive.Proper watering is surely an important a natural part of raising bonsai.Again, it can help to know whatever plant you’ve gotten.Some varieties of bonsai should be watered virtually constantly; others could get by by means of minimum humidity.If you will water constantly, you run danger of marketing fungal expansion.On another hand, dryness as well as humidity can quickly kill a new plant if you’re not monitored.For you to water your own bonsai efficiently, you will have to understand numerous particularities of one’s plant. Repot carefully.Repotting bonsai if you feel like it’s not at all a good plan.Most bonsai tree plants tend not to hold way up well with stressful cases – repotting listed.Bonsai plants are likely to be root-pruned and also repotted annually, often all through springtime.Some kind can vacation in the exact pot for two main years and you should watch your current plant carefully to find out if it requires repotting.